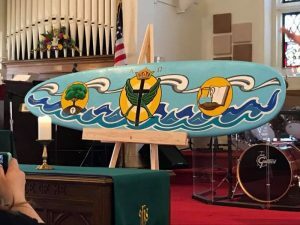 In early 2018 the surfboard made its debut in church. It was an awesome visual aid and helped us think about surfing with the Spirit. 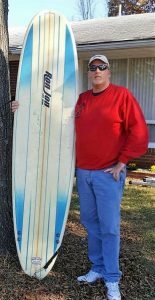 What do you do with an old surfboard once it has helped illustrate a point? My sense was that I would not find many buyers here in Pennsylvania and I was not keen on carrying in back to North Carolina in hopes of reselling it. We were excited to have Neilson accept the challenge of transforming our vision statement into a work of art. Neilson joined us for the unveiling today and it was amazing to listen to him share the process he took to move from words to image. Surfs Up! Let’s discern the movement of the Spirit in our lives and world, and may we join in the work of the Kingdom. In 2018 First Baptist Church commissioned Neilson Carlin to capture our Vision Statement in artistic form. Throughout the year we were exploring the idea of riding the wave (movement) of the Spirit of God. 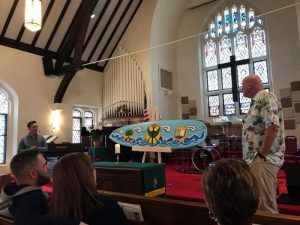 Much like a surfer watches for, discerns, and then rides great waves we believe our call is to look at the world around us and discern where the Spirit of God is at work and then join in with all of who we are. Central to who we are is our desire to live and move as a Christ-centered, Holy Spirit-led community. The cross, palm branches, and crown all represent the centrality of Christ to our faith and the life of our community. The flame symbolizes the Holy Spirit and captures our desire to be led not by our own desires, dreams or wishes, but to follow the leading of the Spirit in all we do. The right side expresses our desire to be a people that use our gifts to meet the needs of individuals and families. We serve others by sharing the blessings we have received with those in need. Our goal is to meet all people in their time of need and share God’s blessing with them. The image of the mustard tree captures our goal of Empowering people to grow into mature followers of Jesus. We believe that every person is a spiritual being, created for relationship; relationship with God and other people. Each person’s journey is different, and yet they all have a beginning. 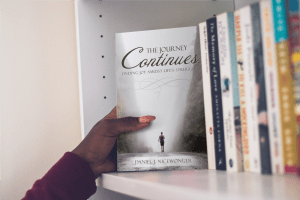 We invite you to journey with us as we pursue spiritual growth. The wind and the waves throughout the picture represent the active movement of the Spirit of God in our world and lives. There may be moments we do not “feel” the spirit moving in our world. We remain confident that even in those times the Spirit is moving, inviting us to join in the work of building the Kingdom of God.